He's a retired boxer who finds a baby on his doorstep with the note "She's yours." Except she isn't. She can't be. Or maybe she can. What's a guy to do but ask his single-mom next door neighbor for help? Retired boxer Grayson Hollister is trying his best to stay off the booze and run a successful martial arts center when he finds a baby on his doorstep. Uncertain who she or the mother might be, he enlists his next-door neighbor to help him find the answers. Kara McGarrity runs the town's food pantry and soup kitchen. A single mom who's seen her share of abuse, the last thing she wants is to get involved with someone with a past like Grayson's. But with a baby's future at stake, her maternal instincts kick in. Though both Grayson and Kara are determined to put the baby's interests before their own, it's only a matter of time before adrenaline and attraction take over. But the moment they let down their guard, a local threat they never suspected becomes a danger to them all. 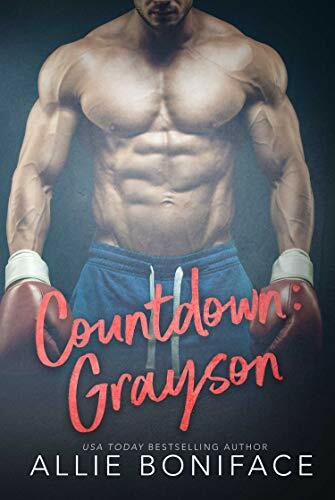 Book 2: COUNTDOWN: ETHAN Releasing simultaneously! Look for pre-order links soon. Book 3: COUNTDOWN: STEELE Releasing simultaneously! Look for pre-order links soon.